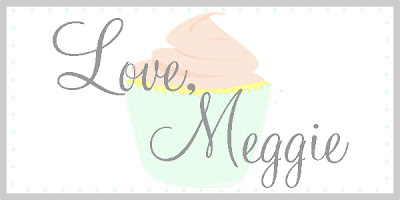 Juneberry Lane: FROSTED: Have Your Cake...and Cereal too! If you're anything like me, your favorite food group is Dessert...but I also have a major weakness for a sweet, refreshing bowl of cereal in the morning. There are so many salty, fruity, chocolatey, & crunchy choices available, it's hard to choose my favorite! 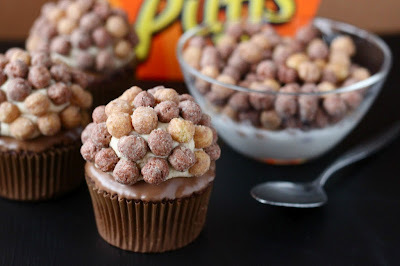 So, when I stumbled across a way to combine my obsession for my favorite breakfast food and my love of dessert, I had to share these fantastic cereal cupcake recipes with you. 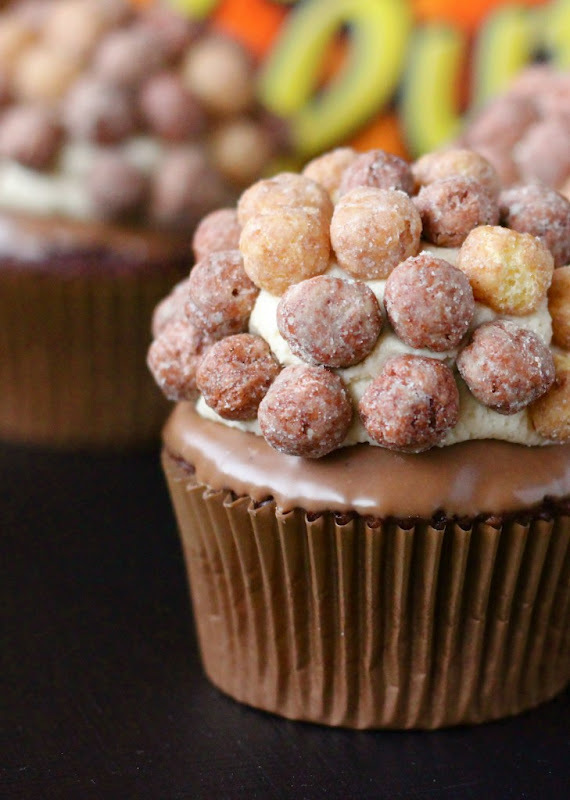 These confections in a cup would make the perfect buffet accessory at your upcoming Halloween costume party, or a money-making treat at your child's next bake sale. So, why not skip breakfast and try a nibble of these cakes? 1. Mix all the batter ingredients together until you get a desired consistency. Bake according to the vanilla cake mix instructions. When finished baking, allow cupcakes to fully cool. 2. When icing, these use a Wilton Round 12 tip. 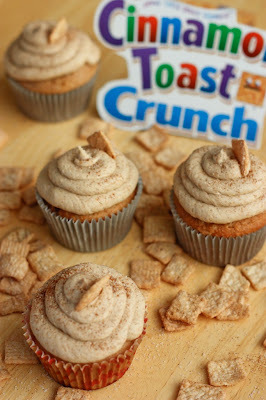 After icing the cupcakes, sprinkle with cinnamon sugar (which is just equal parts cinnamon to sugar), and top with a Cinnamon Toast Crunch square. 1. Pre-heat the oven to 350 degrees (F). Mix the butter and sugar together at medium speed for about 90 seconds, until fluffy. Add the eggs, one at a time, mixing until creamy. Be sure to scrape down the sides of the bowl so everything gets combined. Add the baking soda, baking powder, salt, and vanilla and mix until the batter is smooth. Then mix in the mashed bananas and beat for 30 more seconds. 2. Alternate between adding the flour and milk, about a half cup of each at a time, beating on med-high speed until the batter is light and creamy and all ingredients have been added. Finally, stir in (by hand, so you don’t break up the cereal too much) the Fruity Pebbles. 3. Fill paper-lined cupcake tins 3/4 of the way full. 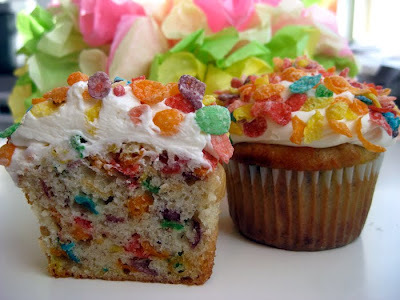 If you’d like, sprinkle some more Fruity Pebbles on top of the batter, and bake for about 22 minutes until the cake is set and has started turning golden brown on the edges. Allow the cupcakes to cool completely before you frost them. 4. To make the buttercream, whip the butter for about 30 seconds, until smooth. Then add the powdered sugar, 1/2 cup at a time and drizzle in about a teaspoon of vanilla extract (a little more, if you like a lot of vanilla flavor). Finally, whip in the malt powder. 5. Once the buttercream is smooth and fluffy, give it a taste to make sure you don’t need more malt powder. 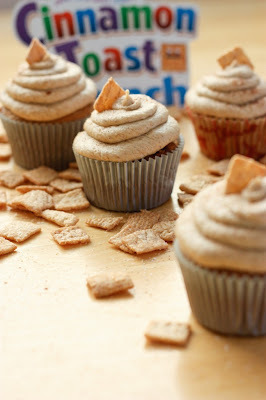 If the frosting is too thick, you can thin it out with a couple tablespoons of milk. 6. Frost the cupcakes and, for extra flavor and crunch, top them off with even more cereal. 1. Preheat oven to 350 degrees and line pans with cupcake liners. In a small bowl, sift cake mix and set aside. 2. In a large bowl, gently whisk eggs, oil, buttermilk, sour cream and vanilla extract. Add cake mix and cinnamon to wet ingredients and stir. 3. 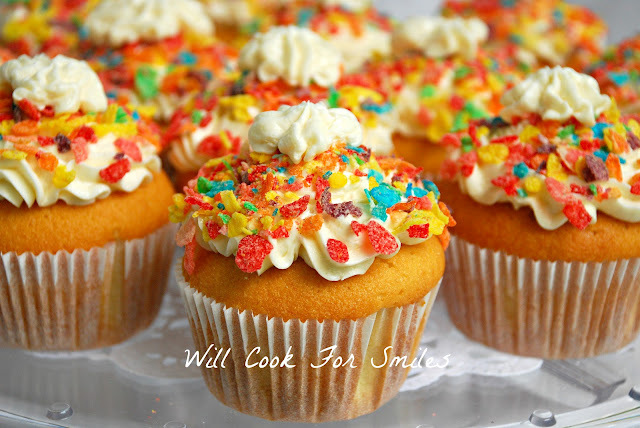 Fill cupcake liners 3/4 full and bake for 15-20 minutes or until and inserted knife comes out clean. 4. To make ganache: Melt chocolate and peanut butter together and stir until smooth. Dip the tops of the cooled cupcake into the ganache and let set for at least 10 minutes. 6. 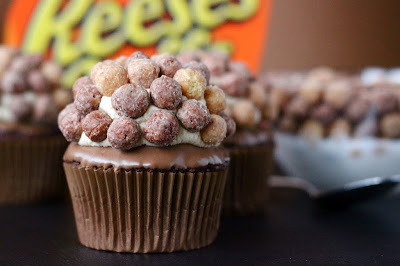 Pipe buttercream onto ganache covered cupcake and roll in Reese's Puffs cereal. 1/2 cup of melted butter or margarine. 1. Preheat your oven to 350ºF. Bake according to the lemon cake mix instructions. 2. Pour the cupcake batter into cupcake liners, until about 1/3-1/2 full and bake for 15-18 minutes (until a tooth pick comes out clean). 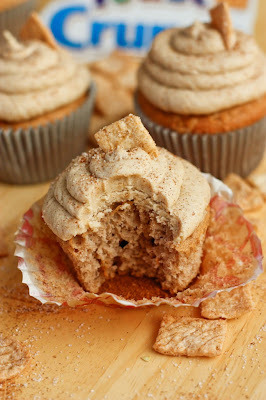 Set aside the baked cupcakes and allow to cool before icing. 3. For the icing, you will have to separate your icing to each individual flavor and color. Whip you icing together until it is nice and smooth. Divide into five different bowls and mix in the following flavors of jello, each into a separate bowl: Lime, Lemon, Orange, Grape & Cherry. For each bowl of individual icing, you will add roughly a 1/4 of a pack of jello (Kool Aid would also work fabulously). Add more or less depending on the strength you’d like. 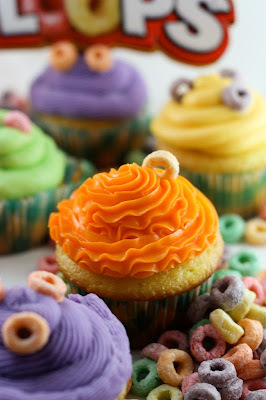 If you like vibrant colors, all the matching Wilton Food Gel color to the icing and blend until completely smooth. 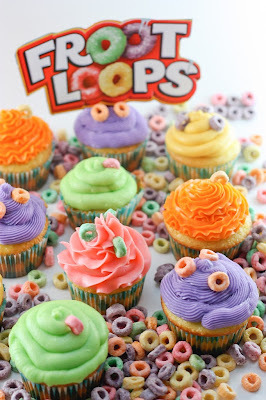 Pipe icing onto your cupcakes, top with Fruit Loops and enjoy! Who needs the milk when you can have frosting? Now you can share the sweet treat of cereal at any time or type of event! 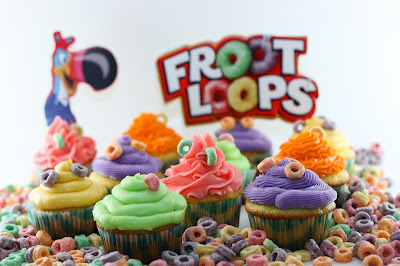 These cupcakes would brighten up a child's birthday party (and they can easily enjoy the cereal topping), bring a unique glow to a baby shower brunch, or create a fun atmosphere at your child's next school holiday party. Think of all the endless possible cereal toppings to decorate with and enjoy. So, put away that bowl and spoon, and grab some cereal cupcakes. Have a wonderful weekend!